Are you suffering from neck, back or shoulder pain and you’re in need of a trusted local Osteopath to relieve you from your discomfort? 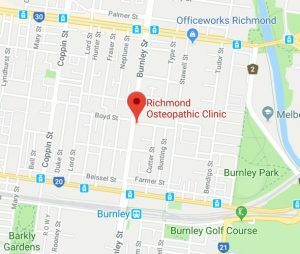 Richmond osteopathy clinic is only a short distance from East Melbourne and has many certified Osteos available to treat you. Getting to Richmond-Osteopathic Clinic is easy and you have many options from East Melbourne. If you are fit to drive, East Melbourne to Richmond is less than 4 kilometres in away. Depending on traffic it should only be a 10 minute drive door to door. Just a short walk (approx 10 minutes) from Burnley station, just hop on the Lilydale line, Glen Waverly or Belgrave line. If you arrive early at Richmond Osteopathic Clinic or feel great after your osteo treatment and wish to treat yourself with a coffee, there are plenty of great cafes close to the Swan Street and Burnley Street corner.